We are constantly on the lookout for the very best products to offer our clients to show off their gorgeous images. Therefore, we are very excited to say that Ulysses Photography has just been selected by LA-based designer Gina Alexander to carry her handbags! The quality of these handcrafted photo bags is outstanding. 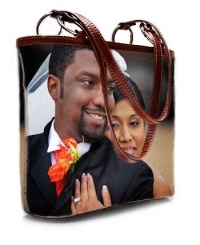 In fact, Gina Alexander bags are carried by many celebrities, including Oprah, Penelope Cruz, Halle Berry, Sharon Stone, Faith Hill, Kelly Ripa, The Black-Eyed Peas, Jennifer Lopez, Alicia Keys, Usher, Elizabeth Taylor, and Queen Latifah. 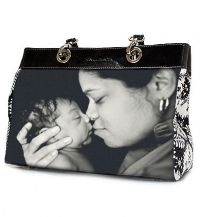 These beautiful designer photo bags are a perfect way to showcase your adorable children, or artistic wedding or portrait images. They would also be a very unique and appreciated gift. Samples are coming soon, and these bags will be available shortly through our online cart. If you have questions or would like more information, please contact us by email or phone. Wendy G. Johnson - Hey Ulysses and Jenni! These bags look so cute! How did I miss these? In any case, I’m sure your clients will love them! It was great seeing you U, at WPPI and glad I could offer some help. Also, thanks for the really cool portrait of me and Ifong, my roommate out there.